We predict by 2050, 95 per cent of seabirds will have eaten plastic. It’s estimated our oceans contain upwards of 150 million metric tonnes of plastic. That’s 150,000,000,000 kilograms. If we converted all those kilograms into litres of water, we could fill the MCG to the brim more than 95 times. It’s actually even worse than that because plastics are usually lighter than water so they’d take up even more space than we can calculate. That’s not even all the rubbish in our oceans – we’re JUST talking plastic. Single-use plastics are becoming a hot topic in the media, and we couldn’t be happier. For many years our marine research team have been fastidiously studying the effects of marine debris, especially plastics, on our oceans and wildlife. Turtles don’t only get caught up in debris, they’re also accidentally eating it. In one of our recent studies, 33 turtles had collectively eaten a terrifying 1057 pieces of debris! In 2014 our researchers found that almost half (43 per cent) of seabirds have plastic in their gut, with young birds being particularly susceptible. 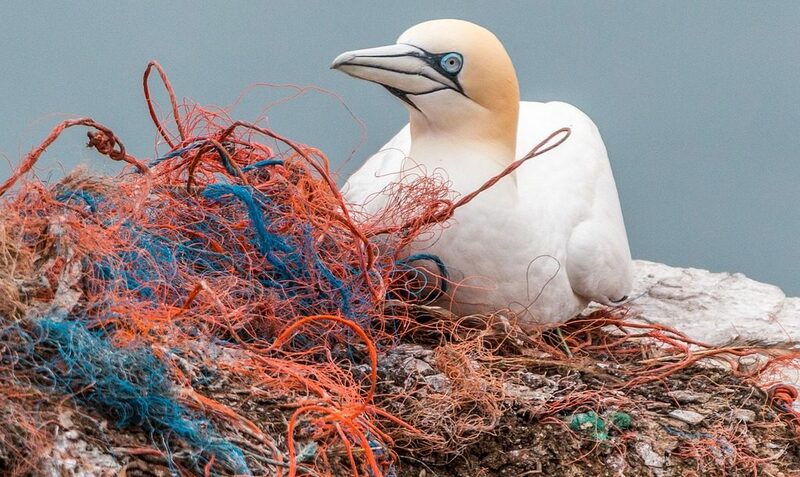 If plastic production continues to increase globally and no effort is made to curb the amount that finds its way into the oceans, we predict by 2050 nearly every seabird (95 per cent) will have eaten some plastic. Consumed plastic often accumulates in the digestive tracts of animals, increasingly affecting their capacity to feed, their health and may even cause death. It’s not just eating plastic that causes problems: many animals are maimed or killed by abandoned fishing nets, which isn’t surprising when you consider six million tonnes of fishing gear is lost in oceans every year. If the idea of a small baby bird dying doesn’t incentivise you to change, perhaps the financial impact will. Pollution in the oceans has high economic costs that affect many different sectors; including human health, fisheries, transport and tourism. It is estimated that marine debris costs approximately US$13 billion each year – and without significant change, that figure is expected to increase. People power: Got a favourite product that is covered in plastic? Send an email to the company advocating for change! It’s not unheard of for companies to review and improve their packaging process after receiving a few polite emails or social media comments from their loyal customers. 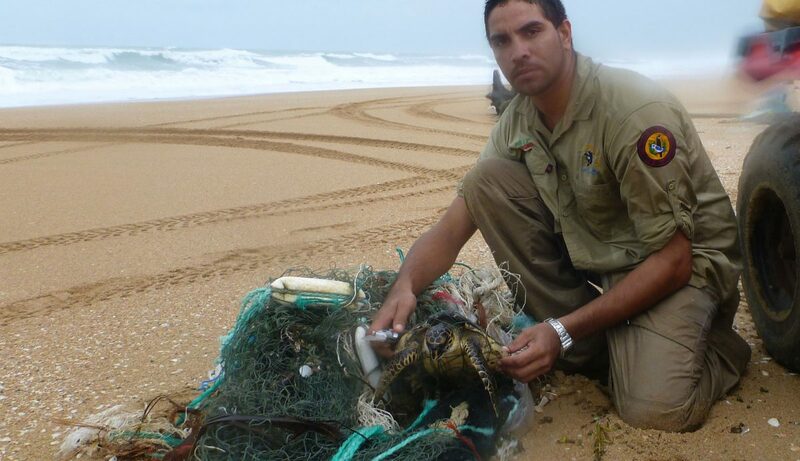 Feeling fishy: As many as 15,000 turtles are caught in dumped or lost fishing gear in Northern Australia each year. So after landing your big catch, take your fishing lines, nets, lures, hooks and sinkers home with you. Plastic-free party: Balloons, curling ribbon and party poppers all make for a festive party, but our studies have shown even rubbish from an inner-city party will make its way to the ocean. Instead of streamers, you can buy some fabric bunting and use reusable cups, cutlery and plates. Bottle besties: Instead of buying single-use water bottles, take a beautiful re-usable bottle with you wherever you go. Not only are you helping the environment, you’ll probably drink more water if a bottle is right there waiting for you. Hello, hydrated skin. Bag brag: In water, plastic bags look uncannily like jellyfish – a staple food for turtles. If you’re not known for your organisational skills and regularly drive to the supermarket, keep a few reusable bags in your car so you have them ready to go when you need them. While you’re busy helping make a difference locally, our researchers are busy working on the world’s largest marine pollution project: helping industries and governments around the world to implement large-scale solutions. Quiz ahoy! How deeply do you know our oceans? Hey! What happened with my previouscomment? You din´t consider it worthy? Unfortunately, our house rules specify we won’t allow comments that could be considered spam. As your comment included a number of links to external sites, we did not approve it in case the sites are malicious. While I’m sure the sites you shared were well-intentioned and legitimate, we always err on the side of caution. We are so glad you read and appreciated the blog. If you’d like to re-comment without external links we’d be happy to approve it! What about the commercial fishing industry? Stop buying plastic today. I have already got plastic bags in my cupboard, so i use them and wash them like dishes, but I will never buy any more. In the supermarket just use mushroom bags for veg and and fruit. They won’t like it ” too expensive” too bad. Monoprix in France can afford paper so why can’t Woollies and Coles? Agree but surely csiro can come up with more substantive recommendations than those. How about 1. Increase landfill levies to improve recycling commercial opportunities; 2. Use the National Envt Protn Measures to regulate packaging and EPR, 3. Product Manufacturing Standards, 4. funding for waste management in the 5 countries that generate 70% of ocean plastic, to name a few. I could continue. CSIRO needs to move on from the politically correct to naming the actions that will actually FIX the problem. You are the credible voice. Please use it adequately.